Find free helpful hints at Landscape Art Tips page to help you become a better landscape artist and more. Art collector tips to help you learn how to take care of artwork. A collection of art books and art gifts that will inspire you and help you grow as a landscape artist and more. For your convenience, you can purchase these items through this website quickly and easily. Read quotes from famous artists and art lovers. Kids' Art Korner -- Learn how to invest in your child's creativity. Read inspirational articles and poems. Landscape art can open windows to beauty. I t's an adventure painting for the joy of trying to create images of beauty! My vision is to create something much more than the mere recording of subject matter. I want to communicate the glory of God's creative power! My goal is to create pictures that will bring joy to others as they view them in their homes or offices. If I just kept the joy of painting to myself, it would lose much of the thrill. Artwork is meant to be shared! It's the need to communicate with others that's crucial. Find original landscape art for sale on this site. It's a gift to be shared which can bring beauty into the our lives enriching them with a special joy. Artwork is a great gift idea! That's why I'm offering landscapes for sale on this site. You skip the middle man so you get much better prices than in a gallery. Yes, it's a wonderful idea to consider a painting as an anniversary gift idea, a birthday gift idea, or a wedding gift idea.or even just because you want to create an artistic legacy for yourself or a loved one. My goal is to transform a scene into a poetic spiritual experience on canvas instead of just rendering subject matter. It's thrilling! Create a mood. Don't merely copy nature. The result will be landscape art that can open a window of joy into a collector's home or office. I love vibrant colors that even surprise me at times. 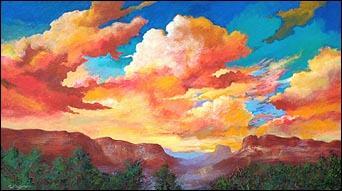 I long to paint the heavens and earth inspired by the unseen hand of the One who created all beauty. Then share this beauty with others by offering them for sale. My desire as an artist is to communicate part of the wonder, joy and pleasure I feel as I observe and respond to the beauty of God's creation. This is my vision and passion. My goal is to transform a scene into a poetic spiritual experience on canvas instead of just rendering subject matter. Psalms 19:1 is my inspiration. "The heavens declare the glory of God; and the firmament shows his handwork."